While every fighter was accompanied by their team this past week for “UFC on FOX 4,” nobody had a bigger superstar in their entourage than featherweight Manny Gamburyan (Pictured). “The Anvil” not only had Strikeforce bantamweight champ and ESPN the Magazine cover girl Ronda Rousey walk on stage with him at Friday’s weigh-ins, but he also had the “Rowdy” one in his corner during his unanimous decision victory over Michihiro Omigawa. 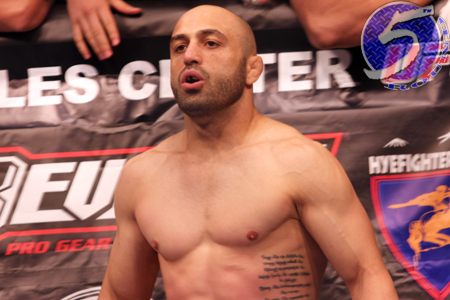 We caught up with Gamburyan to discuss Saturday’s fight, the pressure his boys put on him to snap his three-fight losing streak, as well as his longtime friendship with Rousey. The Armenian bumped his MMA record to 12-7 following last night’s outing.